Discussion in 'The Third Reich' started by jacobtowne, Dec 30, 2006. "In the autumn of 1947 she travelled to Bielefeld and applied for admission to the town's fashion and design school. 'My father was the Reichsführer-SS...' "
That's an excerpt from another gem I discovered at the local library, My Father's Keeper by Stephan and Norbert Lebert, original title Du Denn Trägst Meinen Namen. In 1959, German journalist Norbert Lebert conducted interviews with sons and daughters of several prominent Nazis. Forty years later, his son Stephen set out to contact these same people to discover what had become of them, and how their lives had progressed. His book juxtaposes the two sets of interviews. This is a fascinating and informative work about what it is like to go through life with the name Wolf-Rüdiger Hess, Edda Göring, Niklas Frank, Martin Borman Jr., Gudrun Himmler, or Robert von Schirach. Fascinating work...interesting to compare Frank's son, who hates his Nazi dad, with Hess's son, who worships him. Katrin Himmler on BBC Radio 4's 'midweek' starting now, should be on 'listen again' later. Katrin Himmler is the great neice of Heinrich Himmler, head of the SS, Gestapo and leading organiser of the Holocaust. In her book The Himmler Brothers she goes in search of the truth about the three brothers - Gebhard, Heinrich and Ernst. Family tradition had it that it was only the middle brother, Heinrich, who was a committed Nazi, but Katrin soon discovered a different story. The Himmler Brothers by Katrin Himmler is published by Macmillan. Just started talking to her now. Me listening to Radio 4, I'm old. 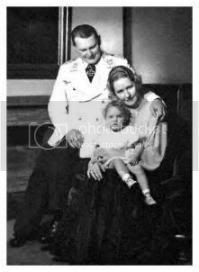 I've been wondering quite a bit again recently about the family of Hitler. Years ago I searched German phonebooks online to see how many people still carried the name 'Hitler'; the answer was very few, if I recall correctly pretty much just a handful in Bavaria. His sister Paula surviving until 1960 got me interested. I can find snippets relating to her on the web but not much of substance, presumably due to an understandable desire to remain private. Paula Wolf, Adolf Hitler's younger sister. Anybody know more; or read any books that cover her and his extended family in more detail? Hmm, did I understand correctly that she died in 1960? Fascinating stuff, Adam. The link to the site about his sister was fascinating. I had no idea she was buried at Berchtesgaden. Born in 1896 in Hartfeld, Austria, younger sister of the German Führer and the fifth and last child of Alios and Klara Hitler. At one time she worked as a secretary for a group of doctors in a military hospital but kept her identity a secret. When she would see a small chapel when travelling in the mountains, she would go in and say a silent prayer for her brother. Each year Hitler would send her a ticket to the impressive Nuremberg Rally. In March, 1941, Hitler was staying at the Imperial Hotel in Vienna and it was here that Paula met him for the last time. It was always her opinion that it was a pity her brother had not become the architect he always wanted to be. Paula was seven years younger than her brother, but he never mentioned her in his writings because of his embarrassment at her weak mental state. I seem to remember that a lot of Germans and Austrians with the surname of Hitler changed it after the war. Wasnt the most fashionable name to have post WWII. 22 Hitlers listed in USA, including one Adolf. Whitepages sounds like some sort of racist directory doesn't it. You have to wonder if it's a given name or one adopted later... if they meant to honour the man himself then at least they spelt it wrongly . Steve, you're ringing a real bell with that branch of the family when you mentioned the decision not to breed, I have a suspicion I saw that and it's since fallen out of my head. Hell of a family name to carry anyway. I'm just struck by the thought you could be standing behind a fairly close relative of Hitler/Himmler/Hess in the queue at Smiths and would never know. Not entirely sure whether I should care either, you don't choose your family. It appears he had some 'Schindleresque' qualities. You have to wonder if it's a given name or one adopted later... if they meant to honour the man himself then at least they spelt it wrongly :wink:. Adam, I'm not sure if you are serious about this. White pages is a common phrase in the US, denoting the section of the phone book that has individual's phone numbers, as opposed to the yellow pages, the section that has pages that are purchased ads for buisnesses. You can be confident I was not being serious about this Jeff . Just that in the context of finding Hitlers the name can take on a whole new 'feel'. I've been rattled since my snafu yesterday, Adam. I am sure you understand. I think I watched a programme recently , which related that the invading Russians were told to seek out Hitler cousins in Austria and the adults were sent to the Gulags . Did anyone else see this ? Beryl Bainbridge wrote a novel called "Young Adolf" , set in Liverpool . It suggests that Adolf may have spent some "missing" months with his half brother's family in Liverpool . i know of a franz goering,who is a member of the german national cross country skiing team.he did very well in this years tour-de-ski.i cannot find anything about his family though.who cares if he is related to the man himself anyway,he is a very nice young guy.yours.4th wilts. This is off Adam's topic, since it concerns children of prominent nazis, but here's the link. Agreed. I've read it too and its a good read.